Cherupayar curry without coconut or green gram curry recipe without coconut makes a great side dish with Indian dishes like chapathi, poori, puttu, dosa, idli or rice or kanji (ghanji, rice soup). Cherupayar curry or green gram curry also known as pachai payar curry is a simple,delicious and popular curry made in South Indian style. This cherupayar curry can be easily prepared using green grams. 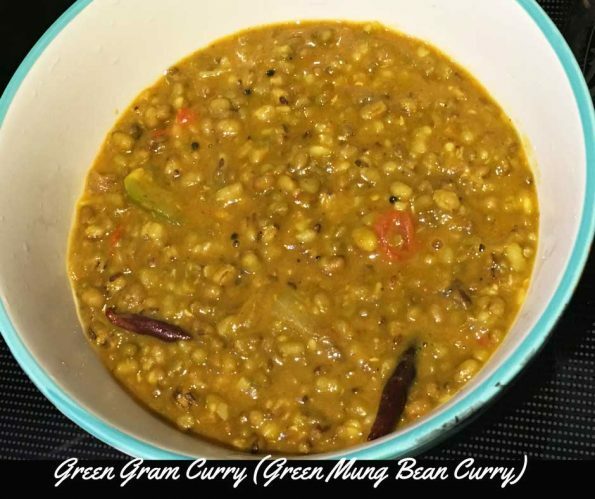 Green gram curry recipe also known as cherupayar curry recipe which is made using green grams(buy organic green grams here) is easy to follow and you can make healthy & delicious green gram curry which can be enjoyed with rice, chapathi etc. 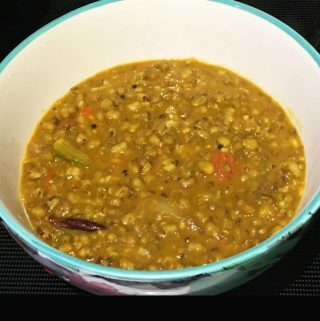 This is an easy green gram curry without coconut (cherupayar curry without coconut) and is a South Indian Kerala style recipe.This green gram curry is vegetarian/vegan recipe and makes a perfect side dish for rice, chapathi, poori, dosa, idli or puttu and so it can be prepared and used as a side dish for breakfast, lunch or dinner for a healthy clean eating vegan recipe. Green grams is also known as green mung beans. Green gram curry with coconut is also another popular South Indian Kerala style recipe and it is also healthy & makes a perfect side dish for rice & puttu. 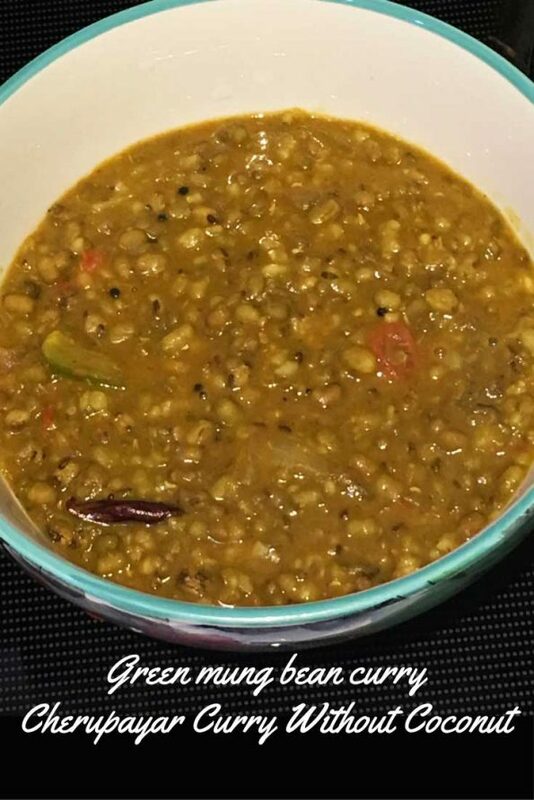 As you can see green grams (green mung beans) also known as cherupayar or pachai payar in South India, is the main ingredient for this recipe. We use tomatoes & onions along with spices to make yummy gravy for this green gram curry without coconut and it takes the green gram curry to another level like a simple & delicious Indian dal curry which is made using green grams (green mung beans) also known as cherupayar or pachai payar in South India (pachai means green and payar or payaru means the peas). So here is how we make this green gram curry without coconut following this easy green gram curry recipe. Cheupayar curry without coconut or green gram curry with coconut is easy to prepare and you can enjoy it with rice, chapathi, dosa, poori etc for a simple, healthy and yummy South Indian style meal. Cut the tomatoes in medium sized or small pieces. To cook the green grams, Wash the green grams and transfer it to a pressure cooker. Add salt and water, close the pressure cooker with lid( and safety valve) and cook for about 6 to 7 minutes or until 2 whistles have come. After 7 minutes of cooking, switch off the stove and wait for the pressure cooker to cool down. To prepare the seasoning, Meanwhile heat oil in a pan and add mustard seeds. When the mustard seeds splutter, add red chilies and curry leaves, fry for a few seconds. To prepare the curry, Add the onion and salt and cook in medium heat for about 5 to 6 minutes or until the onions turn transparent or little browned for even better taste. As the onions are transparent in color or lightly browned, add the green chili, garlic and chopped tomatoes and cook for another five minutes or until the tomatoes are cooked and soft. Switch off the stove and keep the pan away from heat. If the pressure cooker is cooled enough, open the cooker and see if the green grams or cherupayar is cooked enough and soft. If there is any water left, you may not need to add more water for the gravy. If there is no water left after cooking the green grams or if you think there is less water to make the gravy, add more water to make the gravy as needed. Now add the cooked onion tomato mixture to the green grams in the pressure cooker and mix everything well. As I already mentioned above, if there is no enough water to make the gravy, please add more water as you need for the curry gravy. Add all the spices to the green gram in onion tomato mixture in the cooker, and mix everything well. Turn on the stove and bring the mixture to a boil, then reduce the heat to low and cook for another 2 more minutes, stirring in between so as to avoid burning the curry at the bottom of the pan. 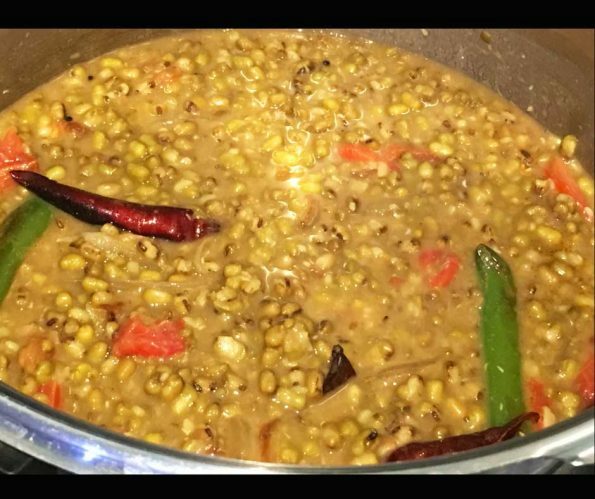 Green gram curry or cherupayar curry without coconut (made with onion tomato mixture) is ready to serve! Serve the green gram curry as a side dish with rice, chapathi or dosa or idli, so you can this for breakfast, lunch or dinner! 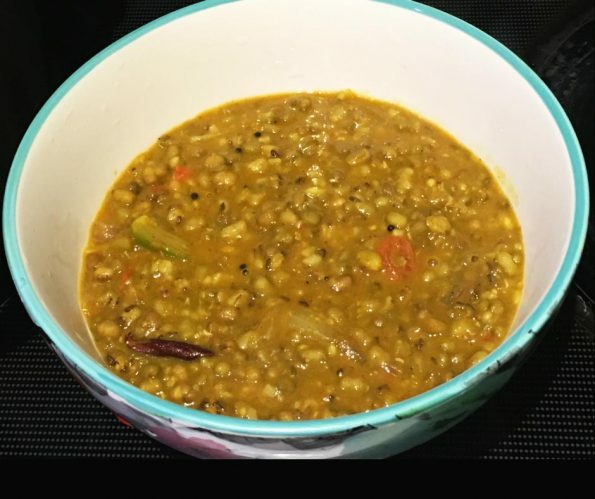 Hope you found this post on green gram curry recipe or cherupayar curry without coconut helpful!